I was excited when I drove by the beautiful Monsters In My Closet sign on Stockon Street near my house. I knew the inside would be a nostalgic treat and in the end I wasn't disappointed! 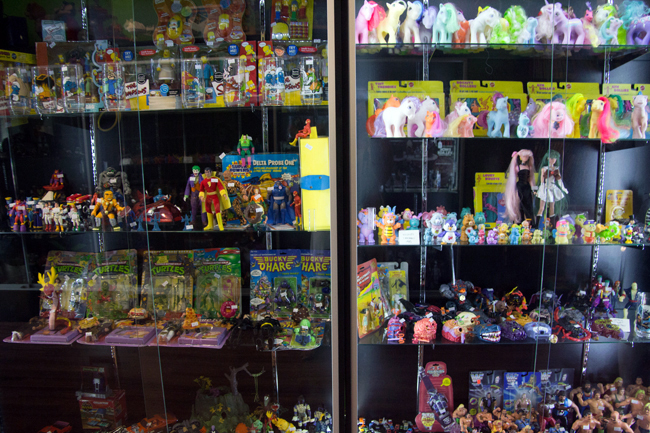 Come take a look at this beautiful vintage toy store with me! 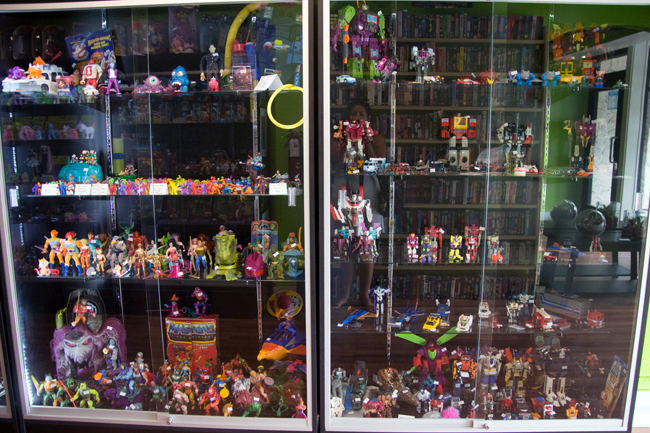 The colors are perfection and the shelf of kitsch, horror and retro VHS tapes + display case of deliciously blocky generation 1 Transformers made my heart swell. They had some of my favorite horror movies there. 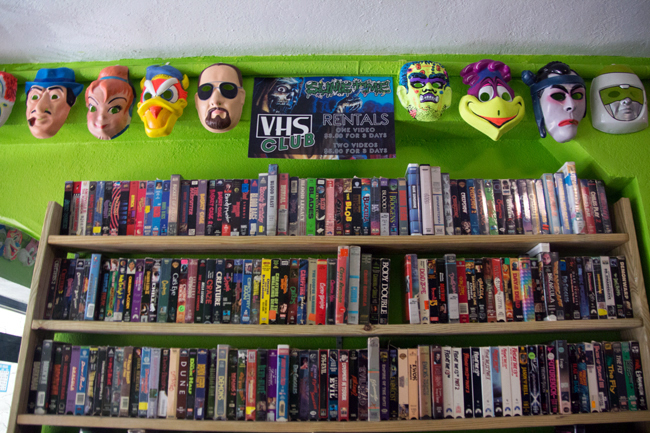 I found out the VHS tapes are actually a rental club! It's funny, I've actually be asked in business consultations more than once if a VHS rental store would be a viable business option as a retro revival. To make a living, probably not, as one part of your business model or out of passion, why not? The owners tell me they're actually out of VHS players because they sell so fast. I of course, adore the Creepshow sign for their VHS rental club and the masks purchased specifically to decorate the store. 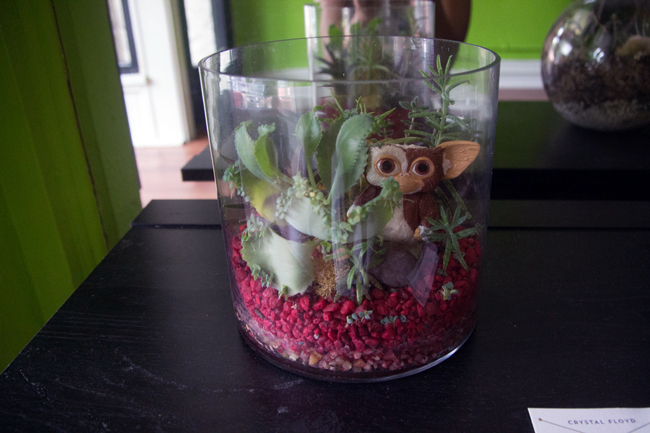 The owner's a tattoo artist so the collections are displayed with an artist's eye for balance and composition. Beautiful to behold, like a toy museum. 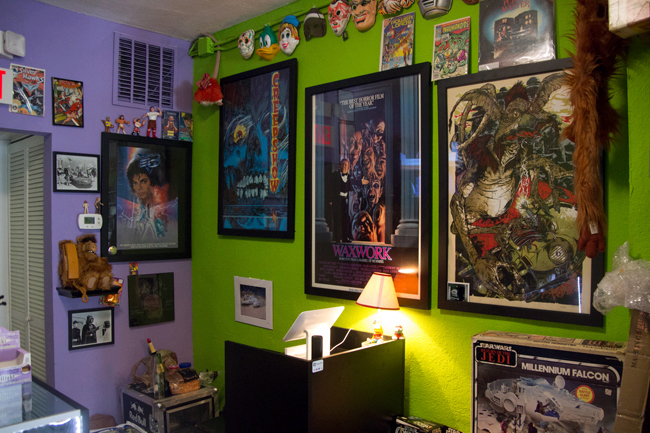 And the space has a cozy vibe, like hanging out in the living room of a dedicated collector. 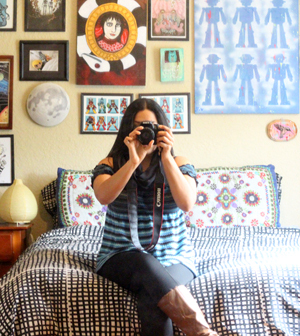 Actually the wall color makes it a little like my second apartment. I sold the owner one of my godzilla toys and a megazord and was kindly allowed to roam about taking all the pictures. I learned he also happens to be vegan and there's a vegan hotdog cart the first of the month so I'll definitely be back for that and to absorb the energy from all those beautiful, well-cared-for toys! 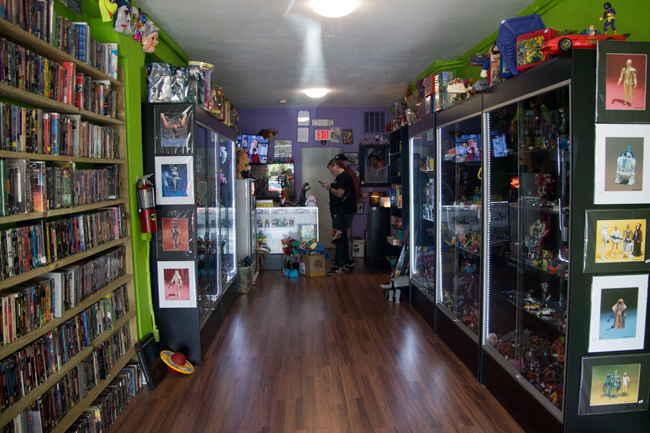 Our area needed a nerdy pop culture collectible hub. I'm so glad they're here and doing well, bringing nostalgia and happiness to their customers. This looks like so much fun, does remembering a lot of these things make me old? Of course not ;) Generation 1 Transformers lined up on shelves never fail to make me joyful. I felt happy little inklings of recognition from playing with different franchise robot toys I saw in their display boxes, even though I couldn't remember all of their names. Ehrmahgerd! This is just my kind of store, Vanessa. I love everything about it, and the cozy vibe doesn't hurt either:D You know, I held on to my old VHS player and still watch some of my old tapes....bwahaha! Who can resist?! :D I've had that vendor once in the next city over and it's delicious. haha. Indeed :) I'll definitely be back to enjoy it all again...and sell a couple more toys and things, haha. And; hotdogs. Haha, that's awesome! Smurf stuff used to do really well for me online when I was a reseller. Unique robot toys have my heart, I've narrowed my collection down to one special one though. Yep yep :) They're cute lined up. I love the Sailor Moon dolls mixed in there too. I never liked the Ponies as a girl (Transformers girl here) but I will always have a shameful girly soft-spot for Sailor Moon.